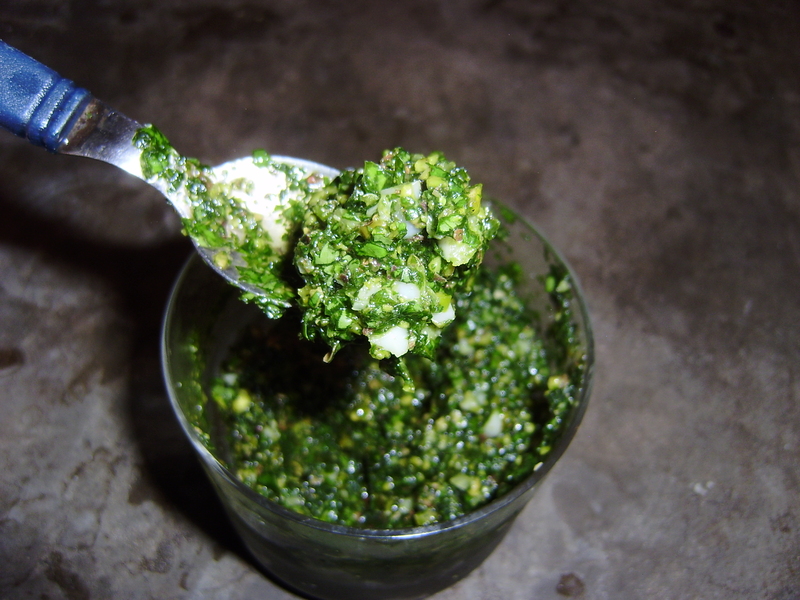 I got a craving for pesto. The old green gunk in the fridge was not going to cut it. I wanted it fresh. Super green. Chunky, sticky and oily. The only problem was that I didn’t have basil or pine nuts or money to buy them. But I did have cilantro and pistachios. So that would have to do. And do it did. Chop cilantro until very fine. Chop garlic until very mushy. Put all ingredients together and keep chopping until fully mixed and very small. Of course, you could skip the first four steps and just put all your ingredients in a food processor, should you be so lucky as to own one. Put your green chopped goodness in a container and add olive oil. Let sit, covered in the refrigerator for a few hours until the aroma is fully saturated. 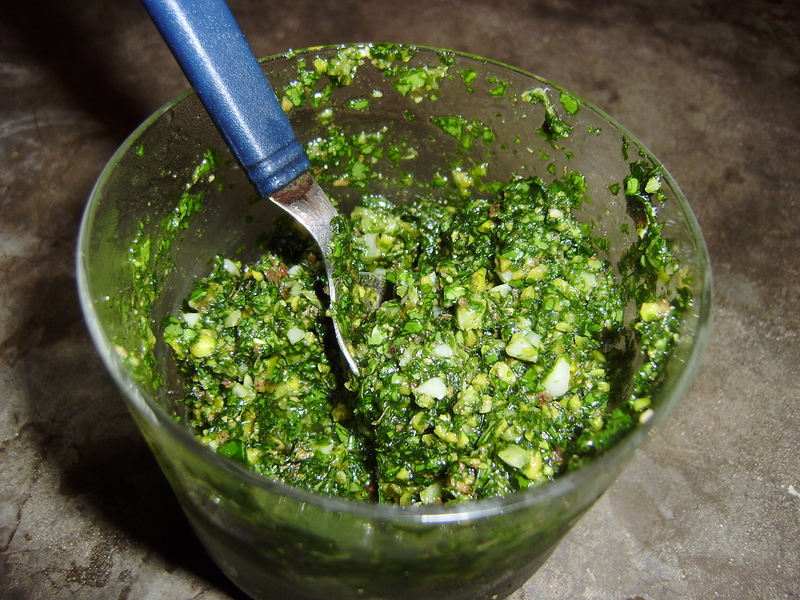 Pesto divino. Perfecto por todo. Que Ricisimo! Good work without any electronic helpers! good pictures, what camera do you like to use?? hi kelly – it’s actually so easy. just chop up your basil leevas, roast some walnuts and pine tree nuts and add them to the mix, add olive oil until you’re happy with the smoothness and parmesan until it’s tangy enough for you. and then just add coarse salt (we love fleur de sel) and pepper to your taste. it’s such a quick way to whip up a pasta dish, it’s crazy we hadn’t tried it before! Pesto Linguini with Chicken and Roasted Tomatoes | .My.Beautiful.Air.